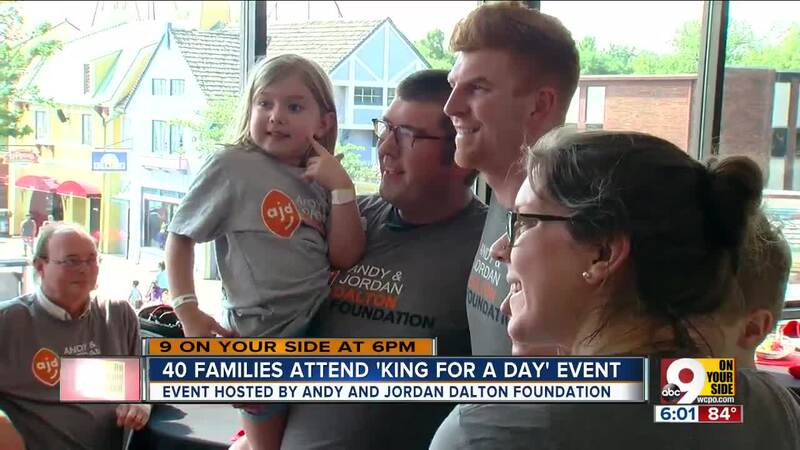 MASON, Ohio – Even though Bengals quarterback Andy Dalton played a game in Dallas Saturday night, he and his wife were huddling with 40 kids and their families at Kings Island early the next day. When Dalton greeted Matthew Harrison, who has leukemia, and autographed his Bengals cap, the boy just beamed. "He's in remission. We're celebrating those things while we can," said Matthew’s father, Shane Harrison. It’s the fifth year the Daltons have sponsored the annual “King for a Day” event at Kings Island. Giving kids like Matthew a special day at the park is typical of the work of the Andy and Jordan Dalton Foundation. "This is awesome,” said Matthew’s father. “It's nice people like him give back and know the community is needing things like this. Really nice. Very inspirational." Dalton said they want to give kids like Matthew a chance to “be a normal kid. A normal family, and just enjoy themselves." The Daltons say they find inspiration in the kids and their families. "There's a kid here who has leukemia. You would never know (from) his positive attitude, how gracious and thankful his family was," the Bengals star said. You can donate to their cause and learn more about it at their website, www.andydalton.org.